Since farming is one of the main occupations of Wyoming, IL, there is a great need for pole buildings in this area. From horse barns, cattle barns, machine sheds, to residential living, Greiner Buildings can provide you with any type of building that you need. Post Frame Construction in Wyoming IL is the best option for farming operations, because they provide the long lasting quality and year-round stability that your line of work needs. Our cold storage buildings are not only strong and durable, but they are attractively made for great curb appeal. Benefit from a design that requires low maintenance, and will last for years to come. Cattle Sheds– Since we understand the importance of your cattle’s health, we have designed sheds that are easily accessible, spacious, comfortable, and well insulated. Residential Homes: Greiner Buildings specializes in custom built homes in Wyoming, IL. Benefit from energy efficiency, fantastic quality, and unique curb appeal with one of our residential pole barn homes. Commercial: Here at Greiner Buildings, we provide 2D & 3D CAD designs for all of your commercial building needs. Horse Barns: If you are in need of a stall barn, riding arena, or horse stable, Greiner Buildings is the perfect choice for you. We can install haylofts, insulation, and design custom stalls for your horses. Hobby Shop Buildings: Greiner Buildings has built hundreds of different hobby shops, each specific to the owners needs. Having a custom designed shop will allow you to flourish in your hobby and work. Insulated Shops: Insulation is necessary to keep your shop and equipment safe. 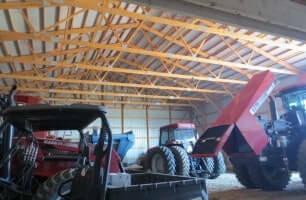 Invest in a professionally insulated shop by Greiner Buildings for ultimate comfort and protection from the elements. Machine Sheds: Our machine sheds come in a variety of sizes and styles according to your personal preferences. They are extremely durable, accessible, and easy to maintain. Mini Storage: A good storage unit is a valuable asset to any business or operation. With a highly trained team and the best materials on the market, Greiner Buildings can provide you with a mini storage unit that will last for years to come. To learn more about Post Frame Construction and Pole Buildings in Wyoming, IL, don’t hesitate to contact Greiner Buildings today. Our team is ready to answer all of your questions and guide you through the process from start to finish.